I had driven past Avalon Hotel countless times before. Located at the base of Beverly Drive at Olympic Blvd., it’s a straight shot down from my place. I was always intrigued by the modern faÃ§ade in the front overlooking a small, U-shaped driveway but had no occasion to visit. What I didn’t know was that the valet drop-off there is complimentary if you are visiting the hotel. Free parking is always an incentive to at least drop by and check out the eats, drinks and scene. What I was there to experience was a new menu selection – Chef’s Cabana Dinner – created by their executive chef Scott Garrett, who comes to blue on blue from Whist at the Viceroy in Santa Monica. The point of Chef’s Cabana was to make a casual appeal to the concept of lounging with friends in a poolside cabana setting that only Avalon Hotel can provide. And I certainly enjoyed the company of savory eats on the menu. We started out with smoked Tasmanian trout and Watermelon gazpacho – both refreshing takes on seafood that was none-too-fishy. The trout, a cousin of Atlantic salmon, sat perched on top of a crustini with dill, radish and endive and might I say, tasted scrumptious. I also appreciated how the watermelon subtly lightened up the tomato blend in each shot of gazpacho. Another appetizer I really enjoyed was a golden beet tar tare that was just a tad sweet. While dining poolside, you may be interested to know that one or two ingredients in your drink or appetizer were probably grown in their rooftop garden. 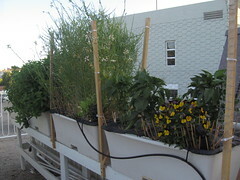 What that means is that there was a lot less fuel burned to get those herbs there – as well as a lot less water used to grow them (herbs are planted in earth boxes). There was green beans and quinoa, burrata and goat cheese, spiced pork tenderloin and halibut with mushrooms and potatoes – but the favorite of the night was definitely the Moroccan lamb with onion marmalade. 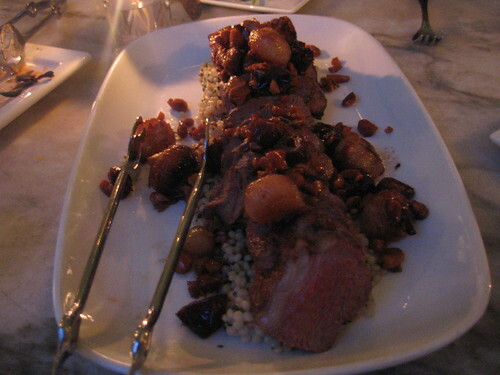 I’ve rarely had lamb to my liking and this dish in particular was cooked just right – not too gamey. And what feast would be complete without dessert? Since Chef’s Cabana is still tinkering with their sweets, Chef Garrett thought it best form in the meantime to serve straight out of his better half’s daytime kitchen – SusieCakes (wife Nicole is pastry chef). Along with their signature collapsible chocolate chip cookies, there were no complaints here. 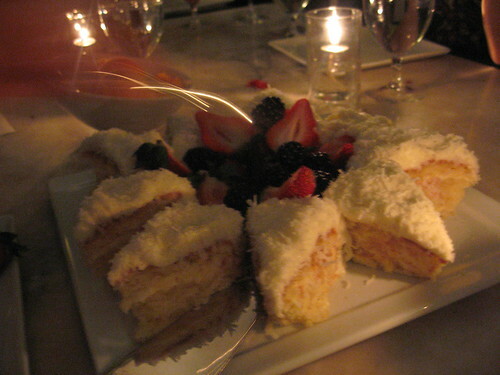 I’ve always loved how moist SusieCakes were – and the coconut cake served at the end of the night hit the spot. You should also know that along with Chef’s Cabana, there is a happy hour kicking off at the hotel restaurant as well, called Groove On Blue. 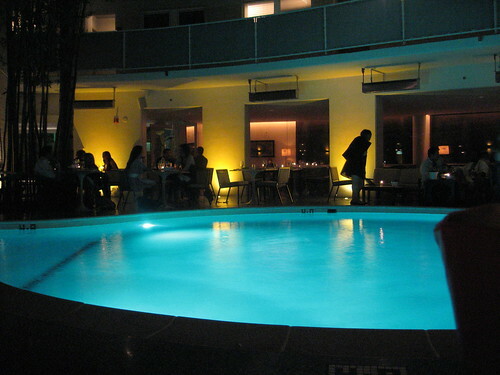 DJ Grand Marquee will be spinning the poolside electro and indie tunes every Thursday night from 7-10PM. Dine-ins will get to enjoy drink and appetizer specials at $8 each. 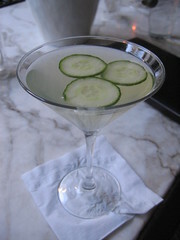 Drinks feature in-house infused alcohol and other ingredients from the rooftop garden and local farmers’ markets. 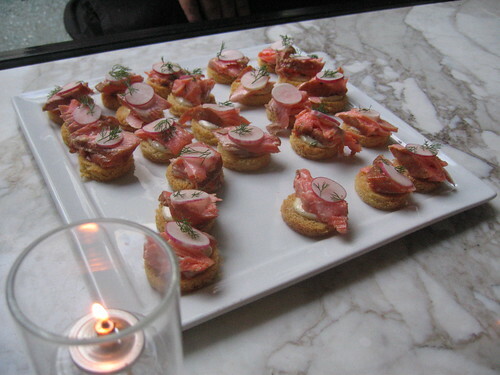 Food menu items include “mini bacon-cheese burgers with cheddar, smoked bacon, and garlic aioli; frito misto with shrimp, artichoke, and calamari; and smoked salmon with cucumber, crispy lavosh, crÃ¨me fraiche, and fried capers.” Yum. Beginning May 24th, Detox/Retox returns to blue on blue every Sunday. The best part is that you have a full 6 hours to take advantage of the day from 2-8PM. Again, special menu items are $8 each – but this time you have your choice of which portion of the weekend cycle you’re on: Recovery (lemonade, frescas and virgin bloody marys) or Debauchery (mimosas, martinis and … non-virgin bloody marys). If it’s your style on a particular Sunday, non-alcoholic and food items are for the choosing. And since on Sundays most people are winding down for the weekend, DJ Grand Marquee will be putting on the lounge tunes for some easier listening. With menu items such as scallop carpaccio, fish tostadas, peanut soba salad and the watermelon gazpacho I’ve tried – I will definitely be stopping by to check the scene out. So check out Avalon Hotel while one of their $8 menus is in effect. It’s set in a location that’s away from the rest of the hubbub that is Beverly Drive but still central enough to be convenient. Your taste buds will thank you. The Avalon Flickr set slideshow, after the jump. This entry was posted in Beverly Hills, Food, Happy hour and tagged avalon hotel, Beverly Hills, blue on blue, chef's cabana, Happy hour. Bookmark the permalink.